Around 1780, there were about eight legal distilleries and 400 illegal ones. In 1823, Parliament introduced an Excise Act designed to encourage the licensed distilleries and ease out the hundreds of small illegal operations. Technology improved whisky production with the introduction of the column still in 1831. This was a less expensive method of production and made for a smoother, and more commercially attractive drink. Punch, or toddy, made with whisky, hot water or tea, honey or sugar, and sometimes lemon, was a popular form of drinking whisky. 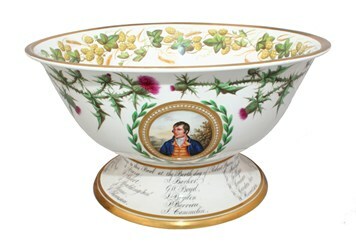 This punch bowl was apparently used by Burns at his brother Gilbert’s wedding to Jean Breckenridge on 21 June 1791. 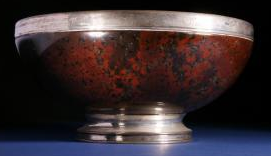 On the bottom of the bowl, a label reads “Toddy was made in this bowl by Burns at the wedding of his brother Gilbert at Mossgeil, June 21 1791”. It is in the handwriting of the poet’s nephew Gilbert Burns and is dated Knockmaroon Lodge (Dublin) 1874. On 25th January 1819, attendees of the Burns Supper at the Globe Inn, Dumfries decided to open a subscription for the purchase of a porcelain punch bowl, for future use at this annual event. 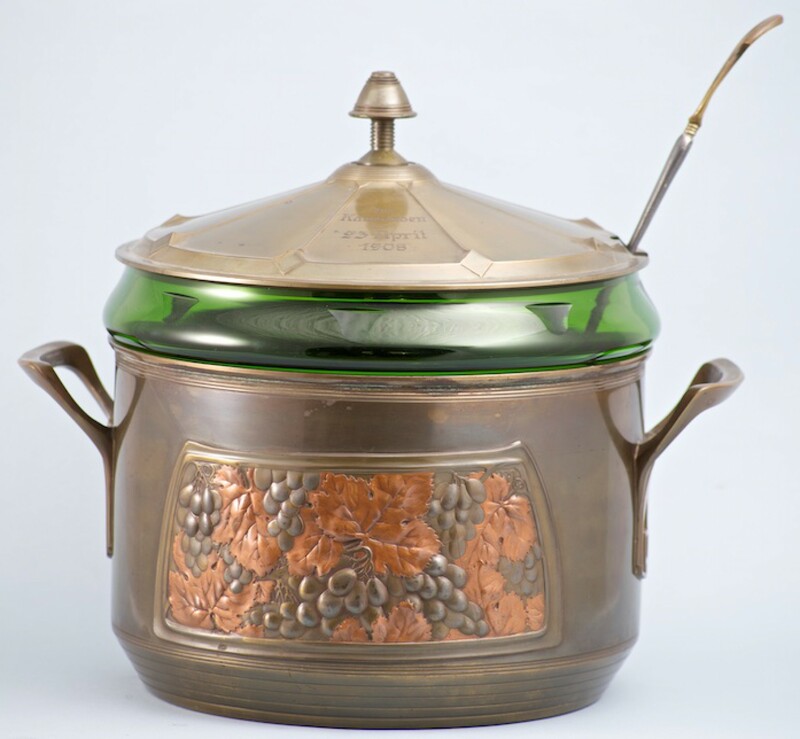 The punch bowl, a silver punch ladle, serving mugs and three dozen wine glasses were purchased and presented at a meeting of the subscribers on 18th January 1820. The subscribers to the bowl decided to form a Society, to be named ‘The Burns Club of Dumfries’. The punch bowl is decorated with several images, and the foot is inscribed with 35 names of the original subscribers.